David Cameron is at last proud to be a Notting Hill Tory - because he is trying to sell his house in the fashionable west London district. The leadership contender usually answers jibes that he is part of the "Notting Hill set" by saying he actually lives in North Kensington. But at an Observer fringe meeting, he says he is abandoning that stock answer for now. "We've got an offer in on our house - I don't want to wreck it," he says. House prices in Notting Hill rocketed after Hugh Grant and Julia Roberts immortalised the area on film. Newspapers last year seized on the idea of young Tories, including Mr Cameron and shadow chancellor George Osborne, emerging in Notting Hill just as New Labour had sprung up in Islington. Mr Cameron said the idea was "a lot of rubbish" which came from newspapers' love of nice convenient labels. "There are people backing me from all parts of the country, all parts of the party and from all backgrounds," said the MP, educated at Eton and Oxford. 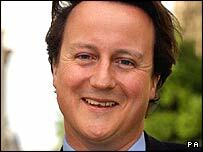 Mr Cameron kept more tight-lipped about whether he had ever taken drugs while at university. Pressed on the issue and on his membership of university drinking clubs, he said he was human enough to have some things but too much of a politician to talk about them. "I don't want to unpick and go into everything in my life," he said. So, did that mean he did try drugs then? "I had a normal university experience, if I can put it like that," he replies.